The stucco technique I prefer to use is very easy to do and it is great for simulating both stucco and old stone walls. It all depends on how you apply the craft tissue paper. 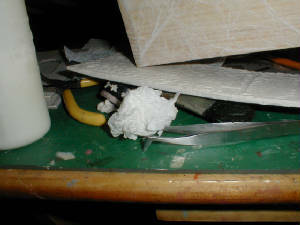 The only materials needed are white craft tissue paper and glue. The only tools needed are a pair of scissors, but you could also just tear the paper with your hands. 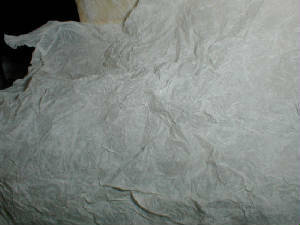 Crumple craft tissue paper in your hands, squeezing tightly. Unfold. Crumple and squeeze again. Unfold paper carefully. Do NOT stretch out the paper yet! The texture of the stucco or stone wall depends on how bumpy or thin your paper is, so decide on how rough or smooth you want the surface to be, and then stretch until you are satisfied with the effect. 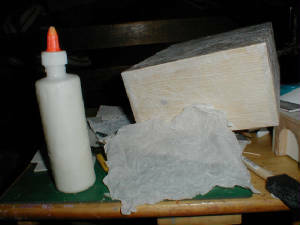 Spread glue onto the wood (or illustration board) and, carefully, apply crumpled paper. Pat down paper, do NOT rub!!! At this point make sure that the paper is adhering to the box. Smooth or pat down more forcefully to eliminate bubbles, if necessary. 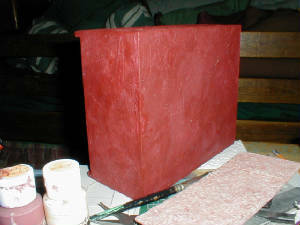 Do not worry if wood is visible through paper, the paint will cover it completely. Note: At this point, you must decide if you wish to add a coat of diluted glue to seal the paper. 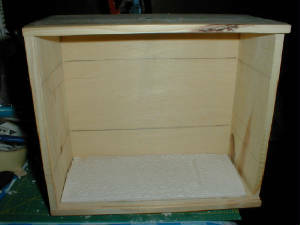 If you choose not to do so now, you can always apply a final coat of sealant after faux finish is applied. 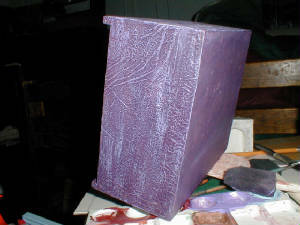 I decided to make purple the base color, since it reminds me of grapes, which are abundant in Tuscany. After the base color was thoroughly dry, I highlighted (dry brushed) the textured surface with lavender, which I applied with a fan brush. Now you can see more clearly the highlighted texture. I used a slightly lighter shade to give it a bit more depth. When I use this technique to simulate an old wall I will use 5 or 6 different shades -- starting with the darker color first and then applying increasingly lighter shades. 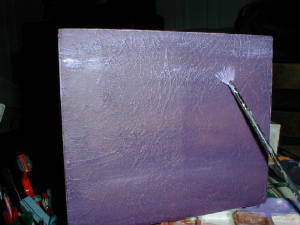 I then do a light wash (watered down paint) of the dark color to age it. 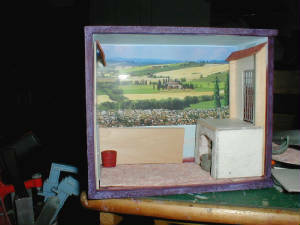 Now that the exterior is done, I can concentrate on the interior.